This page shows the work the media team are currently doing. Please feel free to have a look. This was a quick lesson in how to make things appear and disappear when editing by cutting sections of the video out. 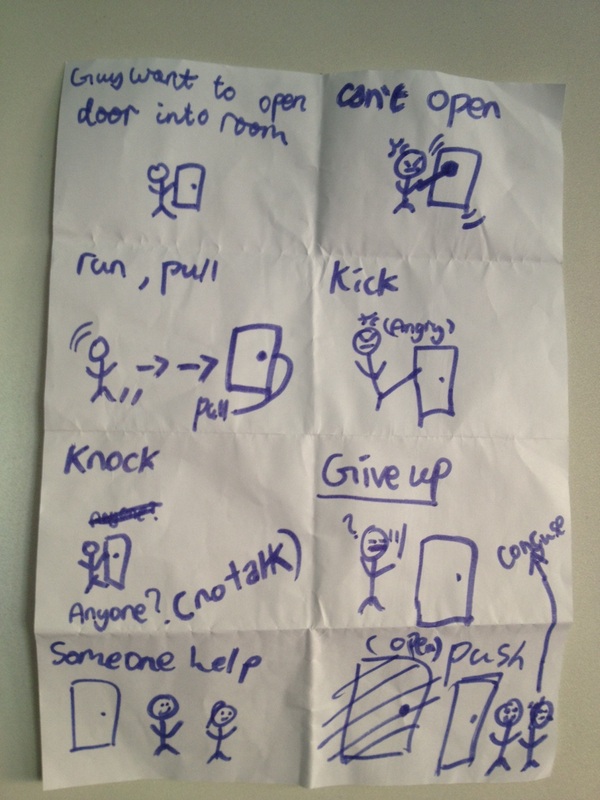 For our silent movie we started by each creating a simple storyboard showing our ideas. We voted on the one we thought might be the most effective as a silent movie. 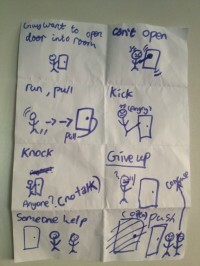 We chose Ka Yin's idea involving someone struggling to go through a pull door by pushing it. Next we split into 4 groups and each group filmed a rough version following their own ideas for camera angles and scenes. Below are our rough films. Todays 'Pulling things together' videos. These videos below show a very simple task through multiple angles and interesting editing to try and make an actual short movie. This is my exampe piece (sorry its a bit untidy but I tried to film myself, which is difficult). Your movie will be of a simple everyday task. It should be no longer than a minute when it is finished (no single shots should be more than 5 seconds). Your storyboards, cameras and computers are on the desks. You can choose a task from the whiteboard. To look at how storyboarding works when planning to film we used iMovie's movie trailer feature to create the following video. By looking through the needed shots we were able to then film lots of pieces which we then cut and pieced into the trailer. This week we are going to look at a video technique that uses different shots cut together in a way that makes the final movie look like it is all one continuous scene. We will try to recreate a similar video to the one above showing someone moving through the school. Below is the Raw camera footage we shot today. This has not yet been edited so has lots of repeat shots and is not yet timed correctly. Next week we will be learning to edit footage to make this into a sinlge seamless movie. We then split into 4 groups and edited the footage using iMovie. Here are our edited videos. They are just about finished, though we had to rush to get them uploaded. Enjoy. Running - An example of cutting on the action. Running from Stu Lowe on Vimeo. BHS film reel from Stu Lowe on Vimeo. Ordinary video is recorded at around 25 frames per second (fps). High speed cameras record at greater fps than this. When played back at normal speed high speed video looks like very detailed slow motion. We will be using a camera that can record at 210 fps and 400 fps. This should let us see details that our eyes are just too slow to see in the real world. The videos below show some examples of high speed footage. Interesting camera angles to create a more interesting scene. Today you are going to split into 2 groups. You will choose one person as the actor and the other two will film them doing a normally boring task from lots of different angles. you are then going to use final cut to edit together a scene that uses all the different angles and music if you like to create an interesting scene. Watch the video above for some examples of camera shots. And here is our final high speed video - hope you like it. We are going to be running an animation competition throughout the school using SAM animation. So the objectives for today are to learn how to use it and to create an animated advert for the competition that we can show in assembly. Your characters (haha!) and props have been provided for you. You will need to draft out a quick storyline or script for your animation and then create the animation and voice recording. If you want to download the software at home use the links below, it is free to use.